Volunteering is the lifeblood of the reading service. DERRS has no paid employees and operates entirely with its nearly 100 volunteers. 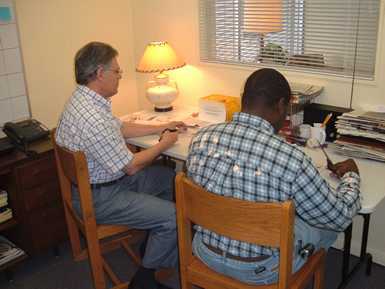 Volunteers prepare and read material on the air daily, assist with clerical duties, serve on committees and boards, present programs to community groups, assist with technical installation and maintenance, exhibits at fairs, festivals, and other public functions, administer surveys, certify receiver placements, pick up and deliver receivers, and prepare and publish public information. This site contains a volunteer application form (pdf: 12kb) that can be downloaded, completed, and submitted to the reading service. A form may also be requested by calling 252-443-7551. Almost everyone can help in some way. Consider volunteering to help our print-impaired friends in Edgecombe, Nash, and Wilson counties. "I love volunteering at the radio station. We have a lot of fun and I think it's worthwhile." "My mom would have enjoyed this, but it wasn't available. I do this in her memory." "I like that it's flexible. I can volunteer on a regular schedule, or whenever I have time." "My only qualification is that I liked reading aloud to my kids. None of us are professionals, but we try." "I like meeting new people and helping others in the community." "It's like being invited into someone's home and you're so happy to be there."